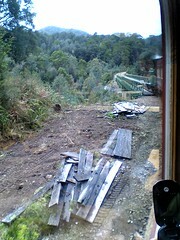 This month I achieved a long term ambition, by riding on the West Coast Wilderness Railway from Strahan to Queenstown, Tasmania. 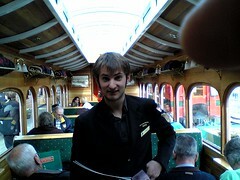 This is a narrow gauge line using the Swiss Abt system to get it up steep hills. 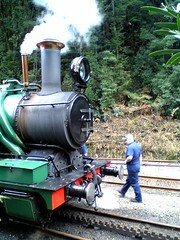 If you are interested in historic steam railways, then you must visit Tasmania and travel this railway. 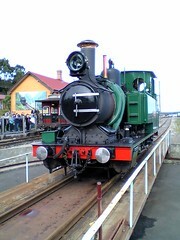 On my previous Trip to Tasmania for talks, I was jokingly asked if I would like to run the railway. I aimed to do a "live" web report from the train, but had to settle for taking some photos and posting them later. 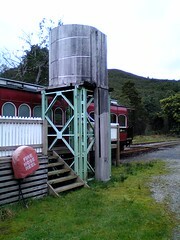 The railway was built to carry material to and ore from the mines at Queenstown. 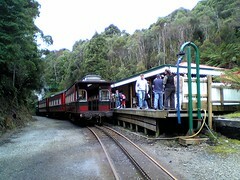 It is now a tourist railway, restored using lavish federal and state funding. The railway has been controversial from the day it was opened, being the subject of company rivalry as well as a pawn in state and federal politics for more than one hundred years. 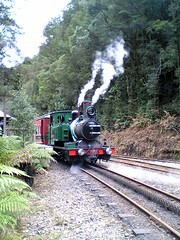 This is touched on in the commentary on the train and covered in detail the excellent historical book available at the Strahan station: "The Abt Railway : Tasmania's West Coast Wilderness Railway" (by Lou Rae, latest edition 2008 ). 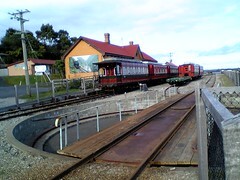 The Strahan station is the restored original (the other stations on the line are modern replicas). If you are a steam enthusiast, then check when you book that one of the original steam locomotives will be used (some trains are pulled by a historic diesel). 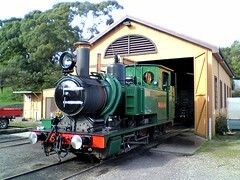 If you are early you may see the locomotive come out of the shed, cross the road and be turned on the manual turntable (two staff pushing with their backs). I recorded low resolution video of the locomotive being turned and leaving the turntable (with the sound of the whistle) and approaching the station. 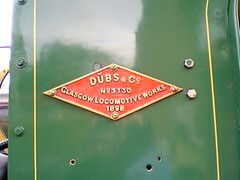 The seam locomotive was built by DUBs & Co in Glasgow Locomotive Works 1898 (No 3730). This is a talk engine, as popularised by the books and TV show "Thomas The Tank Engine". 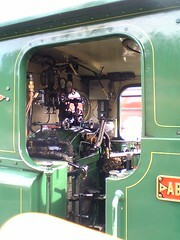 Meticulously restored and carefully maintained the locomotive has gleaming brass and shining steam gauges. It is a bit uglier than a cartoon loco, due to the extra pipes needed to power the rack and pinion "ABT" equipment, needed to pull the train up steep hills. 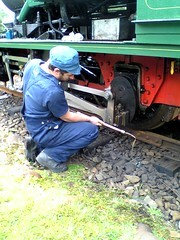 The train is fully crewed, this being a real train which has to meet the usual railway safety standards. Much like an airline flight, the conductor "Tom" (inevitably nicknamed "the fat conductor" despite his slimness) provided a safety briefing, as well as giving some history and selling travel guidebooks (the detailed railway history is a better buy for the enthusiast). 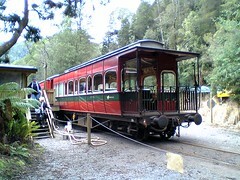 While the locomotives are genuine, the passenger carriages are locally built replicas (the original carriages being used on the "Puffing Billy Railway" Victoria). 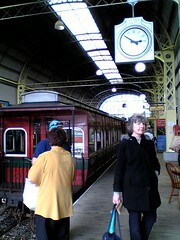 The carriages feature local Tasmanian timber and polished brass (with luggage racks from Queensland Rail). While I went to a lot of trouble to power a wireless modem from USB for the trip, I found there was a 240 Volt power point next to each seat. The line first follows the curve of the harbour, then up a river valley. 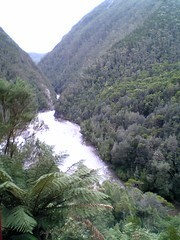 On one side of the line most of the time the line clings to the side of a steep river valley, covered in dense temperate vegetation, with the river visible below. There are several stops for the passengers to get out and take in the view. The stations and some track work are newly built in a sensitive way: not attempting an exact historical restoration. 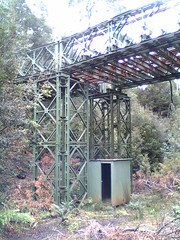 As an example bailey bridge components have been used to build several bridges and the water towers for the stations. Clearly these are not from the 1890s, but are in the spirit of a non-nonsense line. For the rail enthusiast there is the delight of being able to walk across the tracks, examine the ABT "rack" close up and watch the locomotive being oiled and watered. 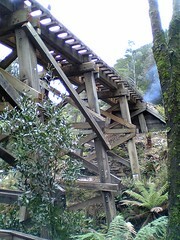 Remains of the original engineering works are event at several points of the trip. 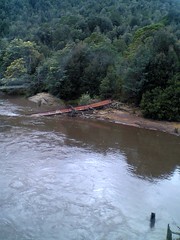 The original iron bridge, washed away in a flood is visible in the river. At another point the original test track for the rack and pinion system can be seen from the 1800s. 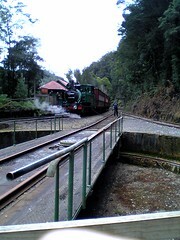 At one station you can observe the train from an overhead bridge. 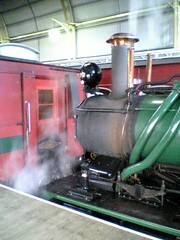 In the photo you will notice that a cover (like a lid on a pot) has been placed over the funnel of the locomotive. 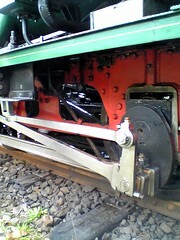 There is also a second turntable, which can be seen close-up. The nearby pedestrian bridge is constructed from the same bailey bridge components as the rail bridge. 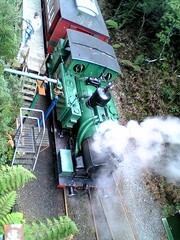 The water tanks which make this a "tank engine" can be best seen from the bridge. 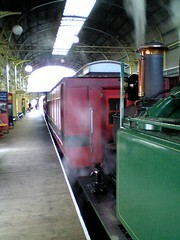 The small tanks also result in the train having to stop to take on water. While the line is short, the steep grade results in the engine having to expend considerable energy. 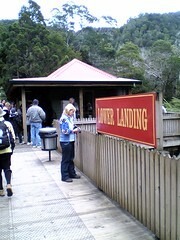 At one station you can walk down to the river. 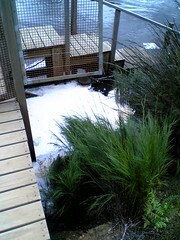 What at first looks like snow on the water is foam from a natural detergent from the forest. The end carriage of the train has a delightfully ornate open observation platform. Several times the safety briefing emphasised the danger of opening the doors while the train was in motion, so it is not clear if the open platform is used. Not all the bridges have been replaced with steel. One is a wooden trestle, which you can walk under. 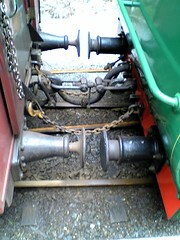 I have included some photos of the buffers and chain couplings, for those interested. 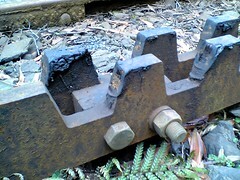 The rack which is used on the steeper track is newly made, to the original design, but the rails are second hand, recovered from other Tasmanian rail lines. The rack and pinion is a complex mechanical device and must require considerable maintenance. Along with the staff needed to look after the passengers, it is not clear how the railway could be a paying proposition, even if full. 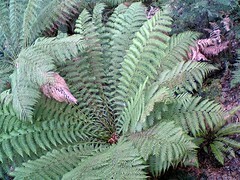 Apart from the railway and the river, there are the temperate plants to examine close up. 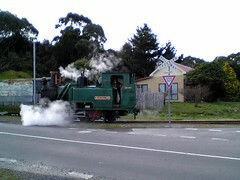 As with most railway journeys it is rarely possible to observe the train itself, or where it is going, while on board. The commentary provided gave plenty of warning when there was a good view coming up and on which side. I was able to get a photo of the train crossing the bailey bridge. 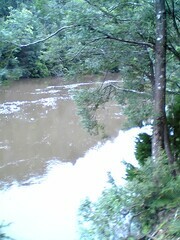 However, the views of the river were frequent, as the train wound around the steep bank. 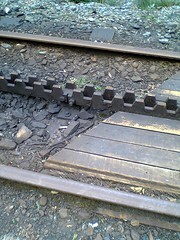 It is difficult to imagine how the line was built with limited use of powered machinery. 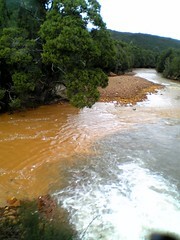 The effects of mining can still be seen in the rivers, with the yellow water contaminated with mine tailings mixing with the black water naturally stained by the grass. 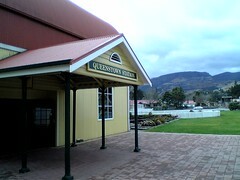 The journey ends at the reconstructed Queenstown station. There is an excellent gift store in the station as well as a coffee shop. 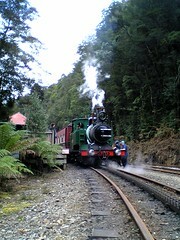 The rail fare includes a bus ride back to Strahan. The trip is half a day, but seems much longer and I fell asleep on the bus ride back. There are shorter trips during the peak tourist season. For those wanting a more adventurous experience there is "Piners and Miners" tour in a stretched Land Rover converted to run on and off the rail line.